Pashtuns are the ethnically unique tribe residing in mountain terrains of North Western Bharatiya subcontinent and in Afghanistan. They are a unique ethnic tribal group with a rich history and culture. There are around 50 million Pashtuns throughout the world, majority of them residing in their traditional homeland of Pashtunistan (Pakhtunistan) consisting areas from south of Amu Darya to west of Indus river. They are the largest and most dominant ethnic group in Afghanistan with around 42 – 60% share in total population and are second largest ethnic group in Pakistan comprising about 15.4% of population according to a CIA estimate. Majority of Pashtuns in Pakistan live in Khyber Pakhtunkhwa province while substantial and ascertainable of them being in Northern Balochistan, Karachi and Lahore. The Pashtuns are the world’s largest segmentary lineage ethnic group with the number of Pashtun tribes and clans range from about 350 to over 400. Much like every other non-Punjabi ethnicity in Pakistan, Pashtuns have also suffered at the hands of Punjabi interests. Despite being a strong and dominant tribal group of Pakhtunkhwa, Pashtuns have been oppressed at large extent by Pakistan’s most powerful institution – The Pakistan Security Forces. The collective punishment to all villagers for the crime of one person was the most frequent tactic of forces in Pashtunistan, particularly in the Waziristan of FATA. Pakistani Army, which was meant to protect them from extremism and terrorism in the Taliban’s hot bed area, has turned out to be worse than the Taliban. In suspicion of any Taliban links in the village, the Pakistani Army completely decimates the entire village, bulldozing the homes of family members of suspected militants and inflicting collective punishments to entire community/village. No Pashtunwali practices including Jirga are allowed by Pakistan forces in these cases. Landmines were installed in village and community areas of Pashtuns in villages in Waziristan of Khyber Pakhtunkhwa province. Instead of Taliban militants, these landmines used to affect average civilians, children and women. Pakistani forces practices a well-used tactic of abduction, arrest, kidnapping and extra-judicial killings of people who raise voice against them. Pakistan has a history of using these tactics and inflicting severe punishments on Pashtuns. One such heinous incident from the history was ‘Babrra Massacre’ of 12th August, 1948, when 600 unarmed Pashtuns supporters of Khudai Khidmatgar Movement, gathered on Babrra ground Hashtnagar, were brutally killed on the orders of Muslim League leader Abdul Qayyum Khan Kashmiri (the then C.M. of NWFP). In May 2014, a small group of students (eight students) of Gomal University from Dera Ismail Khan, Khyber Pakhtunkhwa took up the initiative to fight against discrimination and human rights violations of Pashtuns and triggered a movement initially called as ‘Mehsud Tahafuz Movement’. At the start, the small group lacked prevalence in en masse and their primary demand was removal of landmines from Waziristan and other areas of formerly FATA. The movement rose to prominence in January 2018 when a young aspiring Pashtun model Naqeebullah Mehsud (of Mehsud tribes of Waziristan) was extra judicially killed, on January 20, in a fake encounter staged by Karachi police officer Rao Anwar. The movement made long march to demand justice for Naqeebullah and thousands of Pashtuns joined the movement. The name of movement ‘Mehsud Tahafuz Movement’ was changed to ‘Pashtun Tahafuz Movement’ indicating a greater cooperation of all Pashtuns. “Mehsud’s death sparked national outrage and it soon became a metaphor for the historic injustices meted out to residents of tribal areas”, writes Raza Rumi. ‘Pashtun Tahafuz Movement’ (PTM) lead by a young dynamic leader Manzoor Pashteen carried out protest against Pakistan forces for their crimes. 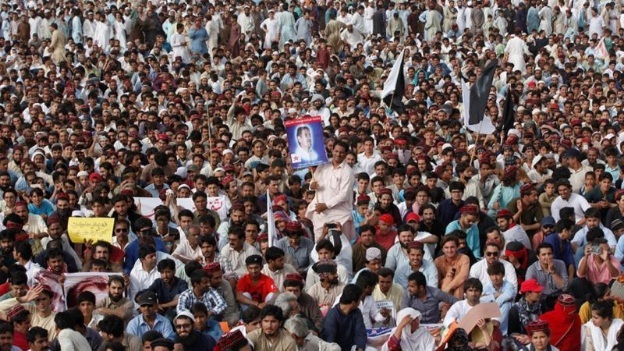 PTM presented several demands to Pakistan government and military including apprehension of Officer Rao Anwar as early as possible, formation of a ‘truth and reconciliation commission’ for cases of extra judicial killings and missing persons, presenting missing persons before the court, removal of mines from Pashtun tribal areas and torture and collective punishment against entire villages be stopped. Pashtun leader Manzoor Pashteen bats for a non-violent movement for protection of Pashtun human rights and he has emerged as a very popular leader with immense support particularly in FATA area. PTM has carried out several long marches and protest rallies in spite of adverse conditions created by Pakistani authorities. PTM rallies are attended by Pashtun hoi polloi throughout the country. On April 08, 2018, 60,000 people gathered at Peshawar, the largest city of Khyber Pakhtunkhwa province. Lahore gathering on 22 April 2018 was attended by 8000 people despite Lahore administration rejecting permission for rally and arresting PTM leaders. Another gathering of Pashtuns in the Swat was attended by 10,000 people. Many protest have been held and rallies have been carried out by PTM giving strong signal to Pakistan that their oppressive regime cannot force the entire community to back down. There have been punishments meted out to students who support PTM and professors are forced to identify students attending rallies so authorities can take actions. Pashteen has been called a ‘traitor’ and a ‘terrorist’ by Pakistani establishments and PTM has been labelled as foreign funded organization. Media coverage of PTM and Pashteen has been blocked and no media is allowed to air news about them. “Punishment is all about sending a message to keep silent” told Pashteen to the Associated Press. Pashteen told “One thousand percent we were sure we would be killed”. Pakistan authorities are hegemonic undemocratic establishment especially the Army. Criticism of Army attracts severe punishments and sometimes extra judicial killings also. “The military has become a state within a state”. “PTM leader Pashteen doesn’t mince his words and has made it clear who he holds responsible for the Pashtun suffering: “We have to identify the place that destroyed us,” Pashteen said at a recent rally. “It is GHQ!” he said, referring to the Pakistani military headquarters in Rawalpindi, cites a DW article. One slogan that PTM regularly uses to highlight the misdeed of Pakistani forces is “Yeh jo dehshatgardi hai, is ke peechay wardi hai” (behind this terrorism, is the [military] uniform). The rise of PTM in this particular way to fight forces for Pashteen Human Rights is described by senior Pakistani journalist Taha Siddiqui as “another Bangladesh in the making”. PTM and Manzoor Pashteen have indicated an awakening in the Pashtun community. What started as a ‘Mehsud Tahafuz Movement’ for clearing landmines in Waziristan has become a Pakhtunkhwa-wide movement for Pashtun rights. This journey has been a tremendous Rise of Pashtuns in Pakistan.